A Durable Power of Attorney is a form that allows a person, most often elderly (known as the “Principal”) to appoint a close friend or relative (this person is known as the “Agent”) to oversee legal and financial matters on their behalf. The term “Durable” implies that the Agent’s responsibilities will stay intact if the Principal becomes incapacitated. This form is for financial purposes only. If you are looking to cover health care decisions you must complete the Medical Power of Attorney Form. A Durable Power of Attorney (form) is for anyone wanting another person to handle matters on their behalf when incapacitated. 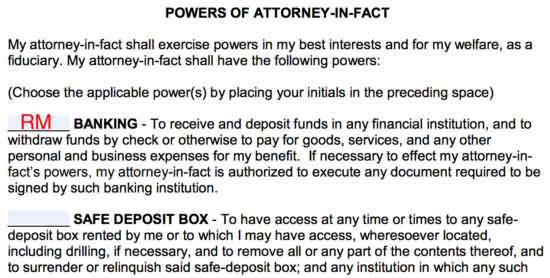 It’s by far the most popular out of all the power of attorney types because it has the “durable” (allows the powers given to the agent to remain valid in the event of Principal’s incapacitation) aspect, which most people are looking for when creating a power of attorney. Lending/Borrowing – Making notes and borrowing money. Safe Deposit Box – Access, creation, and termination. Government Benefits – Including but not limited to health care, social security payments, etc. Retirement Plans – Such as 401(k)’s. Taxes – State and federal. 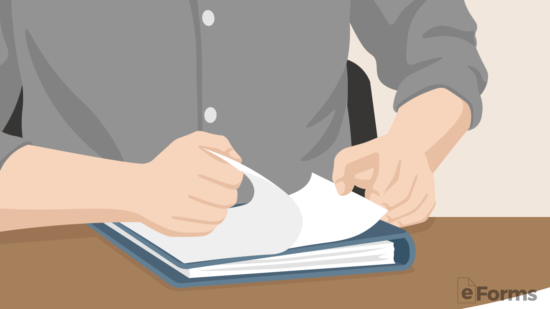 Legal Advice and Proceedings – Filing forms with the court or handling legal proceedings. Real Estate – Buying, selling, and the leasing of property. Personal Property – The handling of all personal assets. Gifts – The power to make gifts. Insurance – Obtaining insurance and/or proceeds. Getting a durable power of attorney will require the principal to find someone that they can trust to handle their assets if they should not be able to handle it themselves. This means that the person(s) selected should be trustworthy fully capable to make decisions and handle the affairs of the principal. Agent – Someone that is trustworthy to make informed decisions about the principal’s finances. Successor Agent (optional) – Elect to have in case the agent is not available. 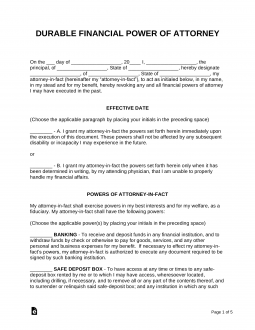 Durable POA Form (3 copies) – It is recommended to bring 3 copies for signing. 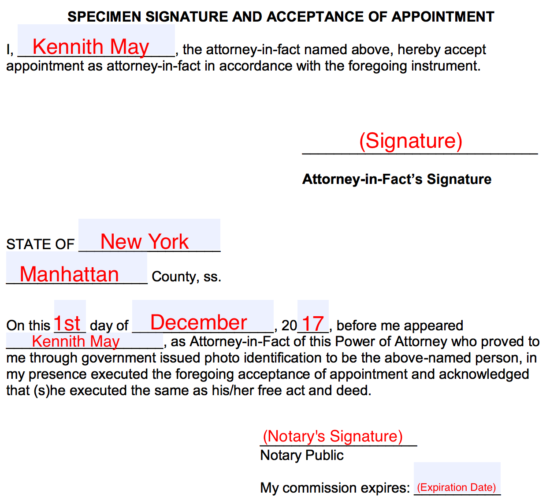 Notary Public / Witnesses – Depending on the State, it is required the form is signed by a notary public or witness(es) present. Most States have a statutory form that is required to be completed in order to be accepted. 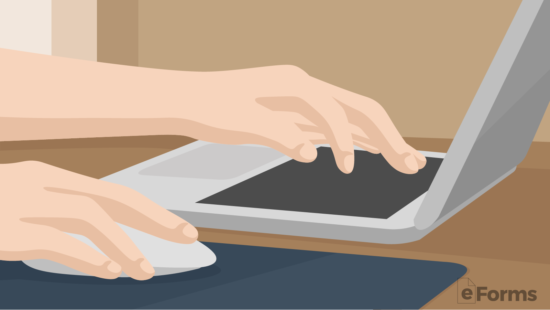 Otherwise, the principal may download the standard template in Adobe PDF, Microsoft Word (.docx), or Open Document Text (.odt) that is allowed in most States. After downloading the principal will be required to select the powers they deem necessary to give in the chance they lose consciousness. In most cases, the principal will hand everything over to their spouse so it is not an issue. 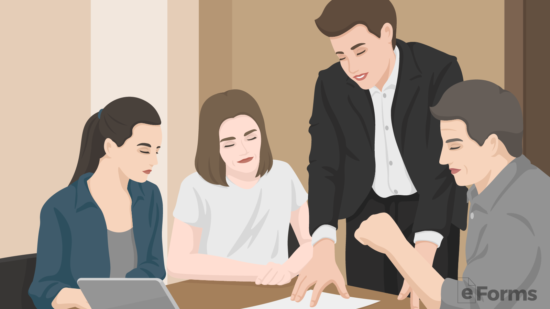 If the principal has partners, they are able to make multiple power of attorney forms and handoff items that are related to the business to the other owners, while keeping all the personal finance decisions to the spouse. The principal will have to decide if the form will be effective immediately or if it will be effective upon the disability of the principal. Disability or incapacitation is usually determined by a licensed physician and usually defined under State law. After the form has been completed the principal will need to figure out the signing requirements in their State to finalize the document. In addition, the principal will need to gather the agent(s) as they will be required to sign the form in front of either the two (2) witnesses or notary public. Remember to make at least three (3) copies of the form for authorization. This ensures all the parties involved will have an original copy. After the form has been legally authorized, the principal should keep in a safe place with more than one (1) person knowing the location. If the principal decides to keep at their residence it should be kept with other sensitive files. Family Attorney – Highly recommended keeping with a family attorney as this will ensure the form may not be altered or modified by anyone. A General POA is used more commonly among business partners or relationships where each party is solely financially dependent on one another. Therefore, if an individual should enter into a medical condition that impedes their ability to clearly think for themselves a General POA would automatically terminate. At the end of the form, the Agent must read and acknowledge the power that they have and how important their position is for the principal. This addendum is recommended to be attached as it is required in some States. 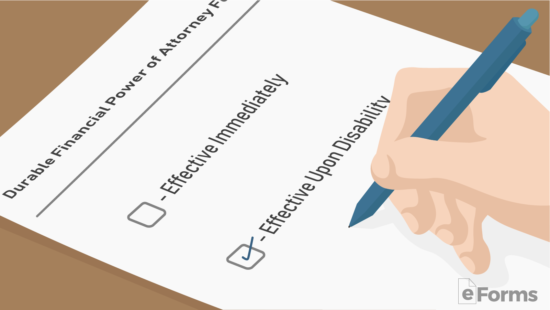 If you need medical powers to be apart of your durable power of attorney, you need to complete a Medical Power of Attorney so that you can instill your wishes in the form in addition to having a trusted person make the best decisions on your behalf. The durable form does not cover health care related decisions, only financial. In addition, the medical power of attorney contains a Living Will, (the combination is legally referred to as the Advance Directive) and allows you to make end-of-life decisions. Such decisions would include whether or not you would like to have food, hydration, artificial breathing, and if you would like your organs to be donated after your death. Attorney-in-fact’s full name, street address, street address, city, and State. Under the heading EFFECT DATE initial either if the principal would like to have the powers be available to the attorney-in-fact immediately or only when the incapacitation should take place. Under most State laws, the principal will have to initial next to each power they are granting to their agent. In our example, the Principal is only allowing the agent to handle powers related to banking, therefore the Principal only initialed accordingly next to “Banking”. Enter the State the principal is a resident. The signature of Principal must be must be inscribed and at least 2 witnesses shall attest to the document by giving their signatures and permanent address. It is recommended to have the document Notarized, as many states require a Durable Power of Attorney to be notarized. The last step is very important, as it gives testimony to the Agent accepting the powers given in their responsibility. The Agent must print his/her name and inscribe their signature. 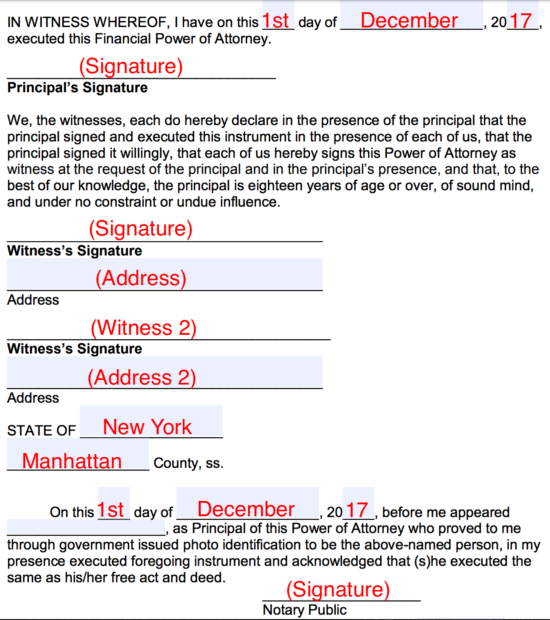 Once again, this document should be notarized along with the Durable Power of Attorney.